Late spring in Pacific Beach is all ash and lavender- the colors of the sky and the blooms on jacaranda trees. The quaint little streets of my beach town are lined by the purple flowering trees, their blossoms carpeting the ground below. But the glory of summer at the sea is put on hold as the marine layer overstays its welcome into the afternoons. It's called "June gloom." It came promptly on the first of the month and doesn't seem to have any intentions of passing early this year. I'm beginning to feel the gloom from too many days without sunshine, and too much sad news trickling in from close friends this month. I'm trying to get excited for my celebration next week, but I'm finding it hard to feel happiness when people close to me are mourning great losses. I'm attempting to keep things in perspective. Today I was able to make peace with the feelings by taking a photo walk with my pup. I observed eerie calm, sprinkled with whimsical color. Such a bittersweet juxtaposition. 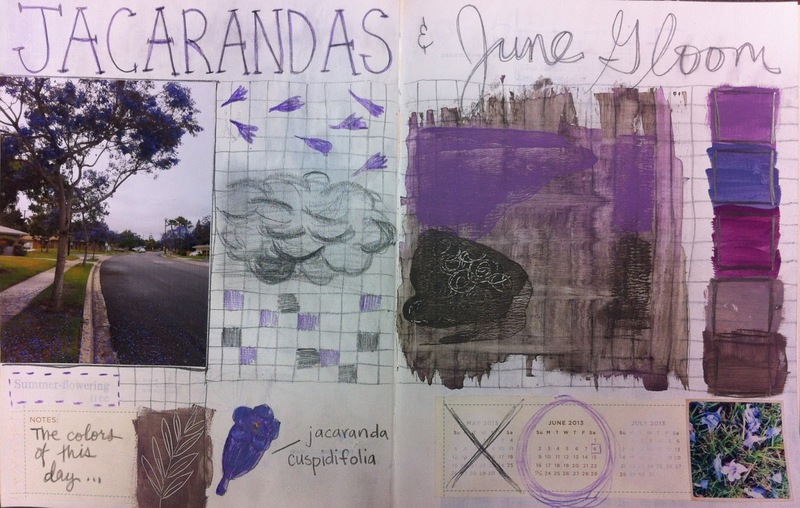 The photo didn't do the color justice, so I decided to recreate it in my art journal. I want to remember the joyful purples and the melancholy grays. I think it's important for artists to capture both of these truths in life. 352/365: Why Do I Create?